Cambridge City Councilor Nadeem Mazen (left) with Kendall Tucker, cofounder of Polis. Mazen was successful in his reelection campaign. 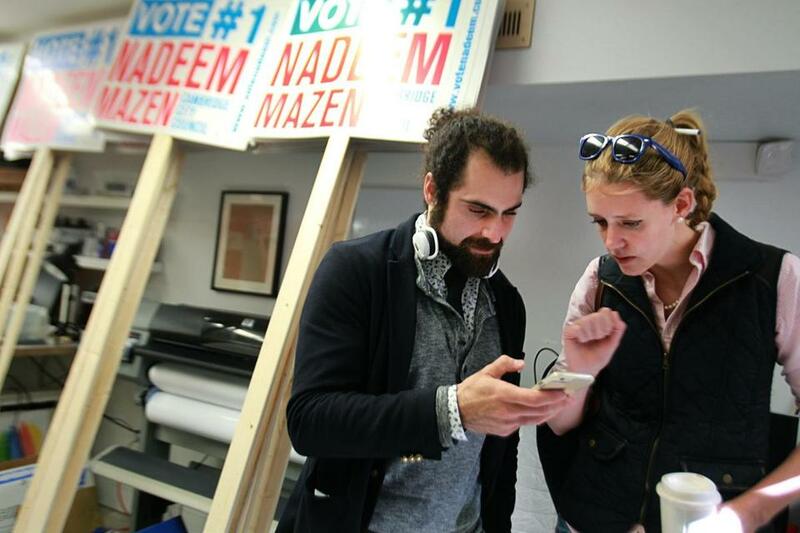 CAMBRIDGE — City Councilor Nadeem Mazen tapped a new piece of technology during his reelection campaign that helped him walk his way to victory this month. Using GPS data and information about likely supporters, a smartphone app automatically generated walking routes for him and his campaign volunteers to go door-to-door to drum up votes. “You can pull out your phone and get the next 20 people to go see — kind of Uber-style,” Mazen explained. Campaign volunteers typed up responses they got from potential voters, and Mazen saw in real time whether any trends surfaced from their answers. Mazen’s campaign was one of the first clients for Polis, a Boston-based tech startup. All seven candidates who used Polis’s app in this month’s local elections won their races, including mayoral and city council contests in Cambridge, Boston, Medford, and Everett. “When they get statistically significant results, say a certain candidate in Boston is expected to do well among young African-Americans, but they find out that they are also doing well with older white people, they can retarget that group,” said Kendall Tucker, a cofounder of Polis. Tucker, a Democrat who worked on Mara Dolan’s bid for state Senate in 2012, and Polis cofounder Steven Liss, a Republican who did tech work for Governor Charlie Baker’s campaign, may make an unlikely pair in the landscape of party faithful companies that cater to partisan political campaigns. A mutual friend decided the two should meet after hearing them lament the inefficiencies of using analytics in campaigns. Liss had recently built an app for the Baker campaign that helped collect data on all of the state’s cities and towns. Conducting their own survey about tech usage in campaigns, Polis found that 81 percent of Democrats used some form of voter database management software versus 59 percent of Republicans. Roughly a year after the duo met, their nonpartisan business venture is aiming to become a player in the New Hampshire presidential primary, the homeland of retail politics and one-on-one contact with voters. Liss and Tucker said they are currently in talks with four presidential campaigns. The pricing for Polis is based on the size of the campaign’s voter universe, so a city council race that is trying to contact 10,000 voters would cost a little over $100 per month. A larger race that is trying to contact 1 million voters would cost about $4,500 per month. Ken Strasma, CEO and cofounder of HaystaqDNA, said analytic tools once used only by large-scale political campaigns are now within reach of candidates trying to win state and local elections. Strasma is best known for developing a system that identified and targeted voters for President Obama’s campaign during the 2008 election. Two major shifts in recent years have made analytic tools more accessible for smaller campaigns, according to Strasma. Powerful computers used to identify likely voters and crunch a variety of data are less expensive. Open-source software, free on the Web, has also dramatically reduced the cost for smaller campaigns to use big data, according to Strasma. “It’s a vastly more affordable than it was a few years ago,” he said. In Boston, Michelle Wu, a city councilor, did her own door knocking in her reelection bid as campaign workers let Polis guide them through city neighborhoods. Wu said volunteers usually have to be trained before they are sent out to neighborhoods with an armful of campaign materials and lists of homes the campaign wants to contact. “The logistics of it can be daunting for first-time volunteers,” Wu said. This year, she was able to cover more ground using the app and realized Polis could also be a tool once she was back in office. While speaking to voters, campaign workers logged minor neighborhood issues (a tree blocking the view of a stop sign) along with broader concerns about what needed to be done to raise the minimum wage and make day care more affordable for working parents. “We got a lot of work done while just knocking on doors,” she said. Mazen said he did not start using Polis early enough in his campaign to take advantage of all of its analytics. Some of his workers still used the paper and clipboard method of collecting data as they spoke to voters at their doorstep. But the advantages of using the app versus more traditional methods of data collection and getting out the vote were obvious, he said, including how it could be used in national elections. “It can give you a real time look and where your support is where they are on the map,” he said. Mazen said tools such as Polis may have greater social implications as well. Training new volunteers with the system of paperwork and how to approach supporters can often be a time-consuming obstacle, he said. “I think there’s a lot of people out there who know something is wrong in government, whether it’s the state, local or federal level, but don’t quite know how to plug in,” said Mazen. He said as new technology like Polis comes about, it could increase grass-roots participation and challenge well-funded political candidates. “You don’t need a political machine if you know how to mobilize 100 people, 1,000 people, or 1 million people,” he said.